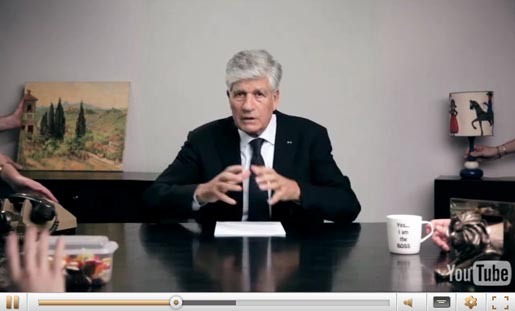 Maurice Levy, Publicis Groupe CEO, has put his annual online speech out in “Digital Wishes for 2013“, a Youtube video with high levels of interactivity. Produced by Digitas France, a Publicis company, the Youtube video features Levy responding to the Youtube customisation options. Change the volume and you have the option of Levy shouting, speaking, whispering or Bob Dylan style on mute. Change the quality of the video and you get the decor changed by stage hands. Pause the video and see Levy patiently waiting with a cup of tea, dusting Cannes Lions, playing the laughing baby video or even recording a new message. Fast forward and see Levy shuffling his papers and working out how to cut to the chase. And of course you can try out full screen view. The Digital Wishes video was produced at Digitas France.